This is a working document and is to be reviewed annually. Designate a Force Level representative who will represent as appropriate at County and Regional meetings. Ensure the continued strategic development of Watches by maintaining Force wide meetings with identified staff and members of NHWA. Maintain an accurate database In respect of watch Coordinators for use by Police, Partners and the NHWA. Effect notified changes to coordinators details in the Ringmaster database. Ensure Safer Neighbourhood staff are adequately trained and informed to support watch schemes. Jointly with Neighbourhood Watch deliver induction to PC’s. PCSO’s and Specials. Jointly with Neighbourhood Watch deliver initial and update training to NHW Coordinators. Continue to review and update communication systems between Police and Watch schemes. Provide annual Watch awards alongside existing internal police awards. Register Neighbourhood Schemes to enable them to receive Free Public Liability insurance. Provide, crime reduction information. neighbourhood newsletters and events as appropriate. Send timely and accurate Ringmaster messages of incidents, requests for information, trends, scams etc. to all Watches. Provide a named dedicated contact with each watch scheme who will agree with its members the frequency of meetings and updates as appropriate to that scheme. Provide information that will involve watches with local problem solving at neighbourhood level. Provide feedback to co-ordinators on actionable intelligence passed via watch members. Assist NYNHWA to submit funding bids for running costs and other initiatives. 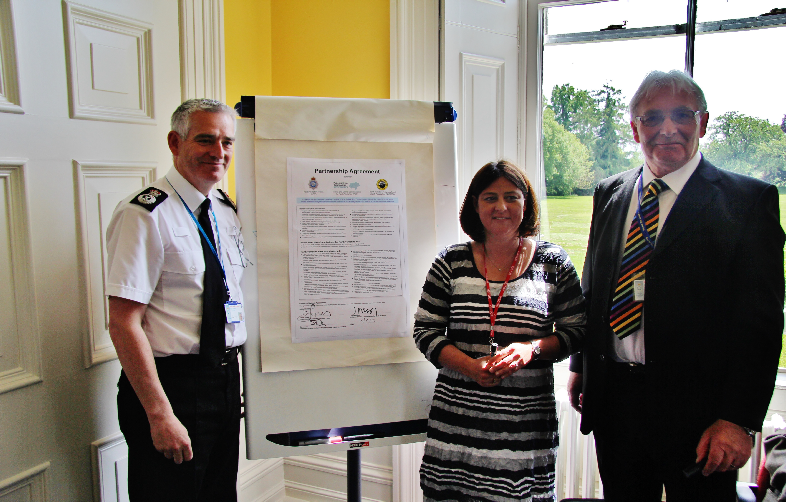 Oversee the North Yorkshire Police role and its development of NHW and the partnership agreement. Join the annual review of the partnership and contribute to embracing an annual incremental improvement plan. Have a clear policy statement of how it will support the police to prevent and reduce crime. fear of crime, anti-social behaviour and improve the quality of life for local residents and ensure a safe environment for visitors to North Yorkshire. Assist in crime reduction and minimise the opportunities for crime and anti-social behaviour. Provide reassurance to local residents and reduce the fear of crime and anti-social behaviour. Inform the NY NHWA Membership Officials of any changes to co-ordinators or scheme details that could disrupt communication or the workings of the scheme. Encourage neighbourliness and closer communities, involving all age groups, especially the elderly, disabled or vulnerable. Jointly with Police Safer Neighbourhood Teams (SNTs), deliver induction to PC’s, Police Community Support Officers (PCSQs) and Special Constables. Jointly with Police SNTs deliver initial and up-to-date training to NHW Coordinators. Develop and maintain accurate Neighbourhood Watch records, enabling the efficient servicing of schemes within North Yorkshire. Maintain County Force wide neighbourhood watch association to share and disseminate best practice and co-ordinate activity. Work in partnership and support the Police in their efforts to, create safer communities across North Yorkshire by promoting and assisting in the set up of as many NHW schemes as possible. These should be prioritised the areas of greatest need, including engaging with minority and hard to engage hard to engage communities, which are currently under-represented within the watch movement. Identify issues of local concern. Become involved in regular community problem solving, agreeing which problems to target and which actions to take by working in partnership with North Yorkshire Police. Disseminate information from the Police to all District Associations as quickly as possible after receipt. Encourage all watch scheme members to record accurately and report quickly any suspicious incidents or any crime in progress. Encourage households within the· scheme to have their property suitably marked and safely recorded either via North Yorkshire Police held database or other means. Get involved in crime and disorder and anti-social behaviour prevention initiatives in partnership with NYP. Encourage the use of Crimestoppers by neighbours who are reluctant to contact the police to report criminal activities. Encourage the establishment of No Cold Calling Zones with the assistance of North Yorkshire Trading Standards. Monitor and report on anti-social behaviour. Arrange meetings as requested to discuss local concerns and develop innovative solutions in partnership with district associations and North Yorkshire Police and/or the Community Safety Partnerships (CSP’s). Link into and work with other watch movements and wider voluntary public sector and private sector bodies. i.e. NYCC. CSp’s. Proudly powered by WordPress. Theme: Simple Grey.